Just 17 days removed from posting lopsided wins at “The Ultimate Fighter 15,” featherweights Max Holloway (Pictured) and Justin Lawrence have agreed to battle at UFC 150 on August 11th. 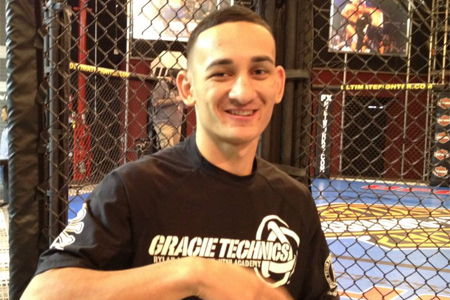 At 20, Holloway is the youngest player on the UFC’s roster. He holds a 5-1 professional record, with his lone blemish coming against Dustin Poirier at UFC 143. Lawrence is perfect through his first four pro bouts. The former TUF 15 contestant successfully made his big league debut by beating John Cofer in the show’s finale. Pepsi Center in Denver hosts the Octagon’s return to Colorado. A lightweight rematch between champion Benson Henderson and Frankie Edgar headlines the pay-per-view broadcast.